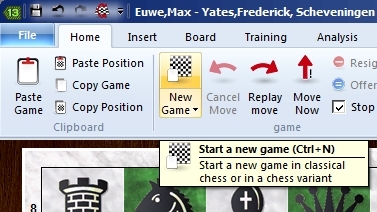 There are quite a few unique aspects to the new Fritz13 chess program’s “Let’s Check” features, all of which center on an online server to which the worldwide community of users are contributing analysis around the clock. 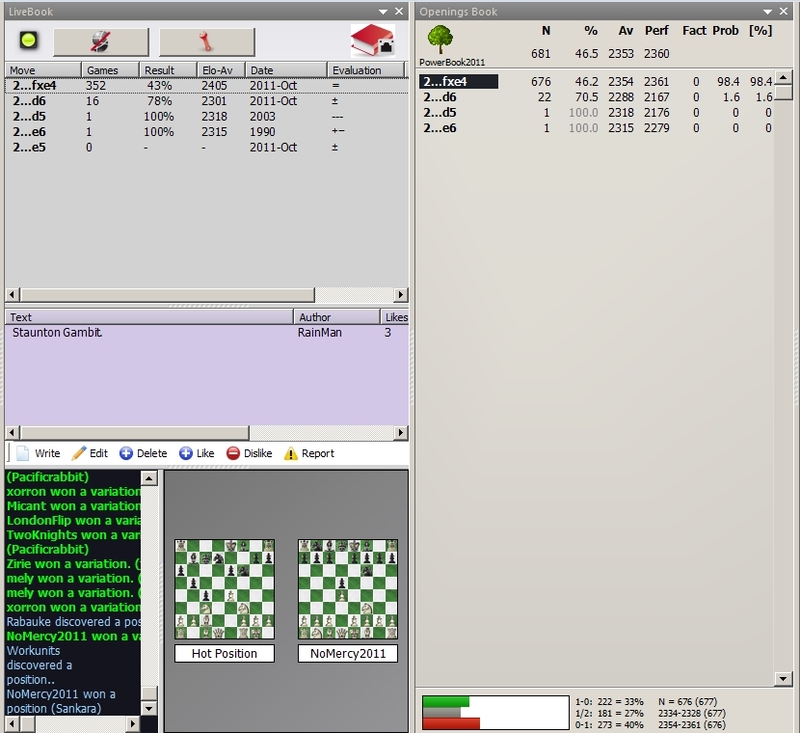 One of the “Let’s Check” features is an opening book which is being constantly updated by new analysis, one which every Fritz13 owner can access as the opening book used by our own chess engines (Fritz13 or any other compatible chessplaying program) when we play against them. 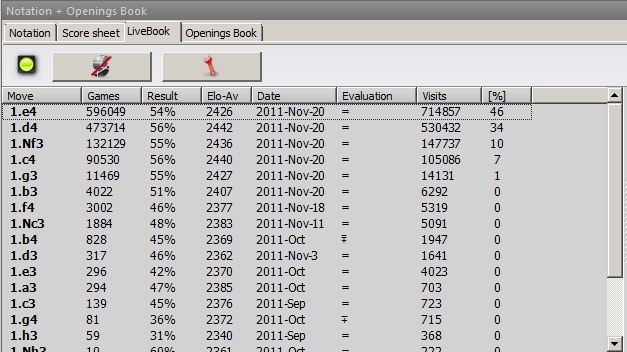 For each move in the opening book, we receive statistical information which is constantly updated as users access the LiveBook and analyze positions from it. Let’s look at each column to find out what the numbers mean. The first three columns are the same as we’ve previously discussed when considering regular opening books (such as Powerbook). Games indicates the total number of games in which the move was played. The core of LiveBook is a database of games (also updated periodically); the games have been merged into this tree which we’re currently viewing. 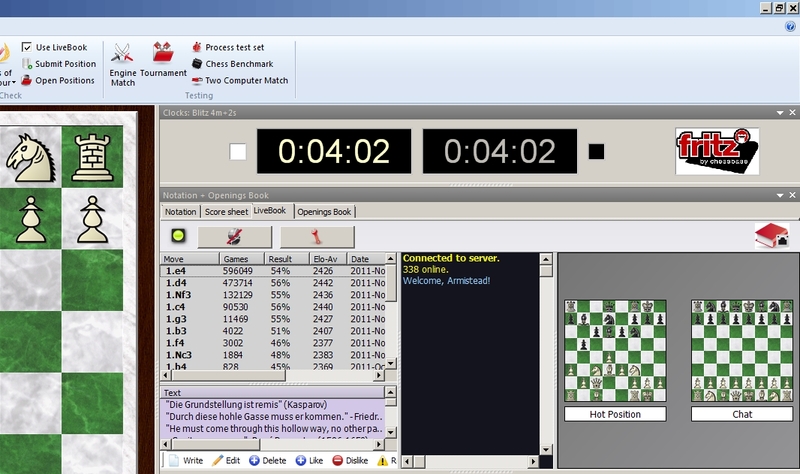 The move 1.e4 was played in 596,049 games in the master database. Result is the success rate, presented from White’s perspective (1.e4 shows a slight edge for White), while Elo-Av is the average rating of the players who played that move (2426 Elo for 1.e4). As indicated, all of this has been examined elsewhere at length. 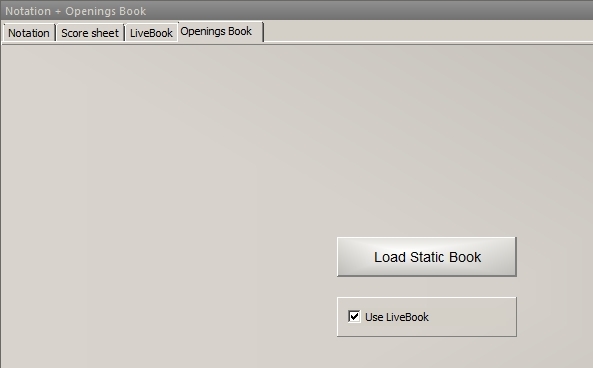 As for the new information, we see several columns unique to the LiveBook. 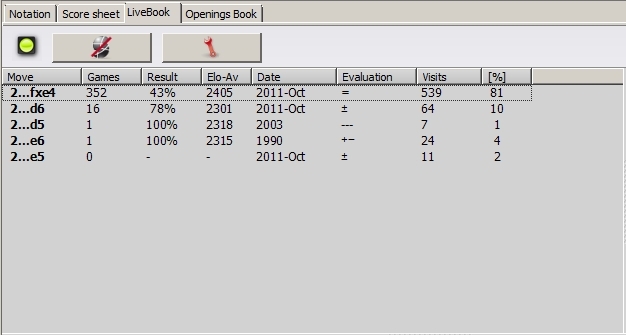 Date indicates the last time that engine analysis was added to the opening book by a user; in the case of 1.e4, the move was last engine evaluated on Nov. 20th). Evaluation provides an analysis of the board position after that move is played, displayed in the familiar Informant-style symbolic notation (an equal position for 1.e4, as shown in the illustration above). Visits denotes the number of times the position has been accessed by Fritz13 users (over 714,000 times to date for the move 1.e4). Finally, % shows the frequency of games in which the move was played (1.e4 was played nearly half the time: 46% of all games). If you see the display pictured above, just click the “Load Static Book” button and select an opening book from one of your local drives. …in which you can compare the moves and corresponding statistics of both books side by side. Fritz13 is available right now from USCFSales.com, the place to go to satisfy all your chess needs!